Instructions for making the Matching Color Shades activity can be found here on the blog Tot School. Choose one paint strip and separate out the colored clothespins that match it. Present your tot with the selected paint strip and matching clothespins. 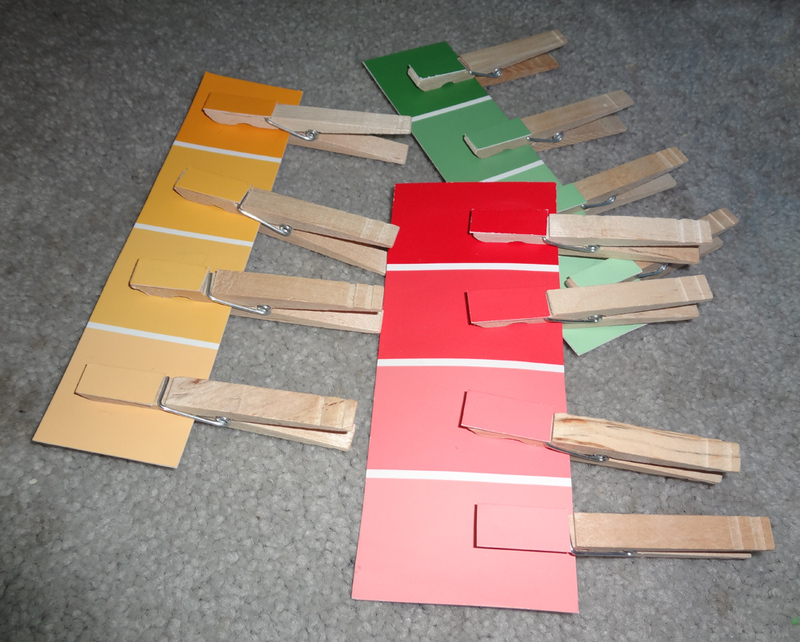 Choose one of the clothes pins and hold it next to the color at the top of the paint strip. Model your thinking by saying, "Do these shades match?" and then (depending on if it matches or not) "No, the shades don't match. I think this one is darker..." or "Yes, these match!" If the shades don't match, move the clothes pin down to the next darker color and ponder over whether they match or not. Invite your child to give you an opinion. Keep going until you reach the matching shade. When you reach the matching shade, say, "These shades match!" and deliberately show your tot how to press the ends of the clothes pin to open it, slide it onto the card, and release the clothes pin to make it close. Select a new clothes pin and repeat the process. Hand the work over to your tot once they understand the activity. For younger children, work on basic colors only: Blue, Green, Red, Yellow and not the different shades. For older children, mix many color shades and have children work independently.